Initial Acid Development in the “Ripening” Milk. In the past i’ve skated over this phase of cheese making as being less important than what follows, and perhaps that has been a mistake. We got the 10 galls of pasteurized goats milk to a good setting temp (86F) and added ½ teasp. of Flora Danica and ½ teasp. of the “other culture” – the Ph. was 6.6 and even after an hour “ripening” the Ph. had hardly dropped .1 to 6.5. – I expected more. Still, time demanded we move on to adding the rennet. I thought back to my Robiola makes (a recipe where the milk ripens for hours prior to the addition of rennet). Conclusion – Next make I may need to add a little more starter culture and give it a little more time to work. Clearly yesterday we scored a goal with the amount of rennet added – I dialed back considerably on the rennet – (25 drops for 10 gallons (Wow! -Only 2.5 drops per gallon – this is getting real close to the Robiola). Previous makes had shown too quick curd development in 1 hour (too much rennet). 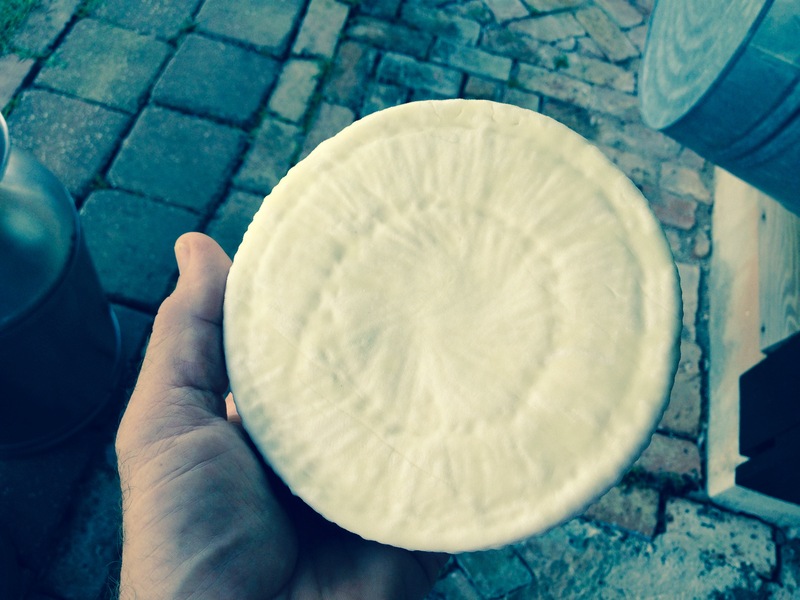 Yesterday, after an hour the surface of the curd mass still looked flat – like milk. At that point we did a “clean break” test which I would say was spot on – the curd mass lifted up and then broke cleanly. We then proceeded to gently cut and stir the soft curd for a good hour or so – down to “pea” size. The Ph. readings continued to seem too high, but again, I put this down to inadequate initial ripening of the milk. After an hour we “cooked” the curd a little by raising the temp. to around 93 – 95F). We went back to the basket molds. Why? 1.) The resulting cheeses just look so damn handsome, and 2.) I wanted to get a “closed rind” cheese surface as the “broken” surfaces of the big wheels have just begun to piss me right off. And 3.) 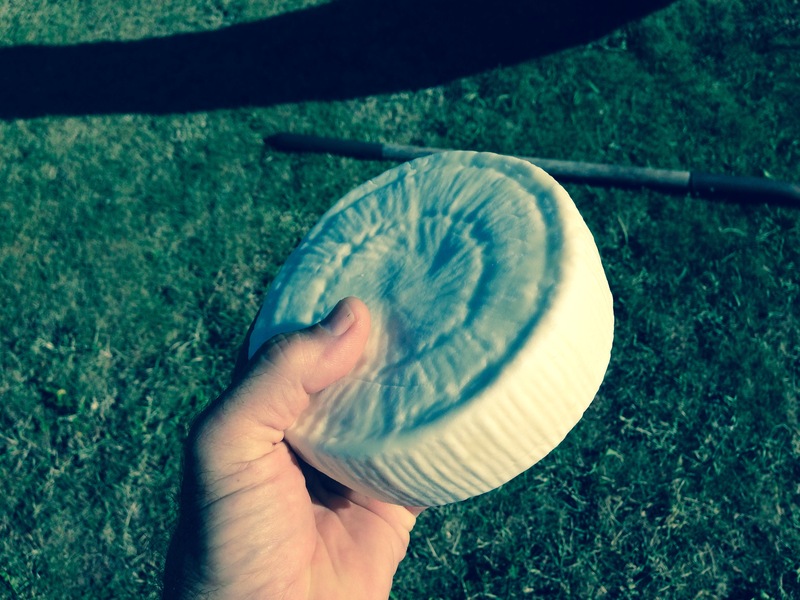 These are smaller cheeses than the big wheels – and perhaps my set up is just better suited to ripening smaller cheeses. 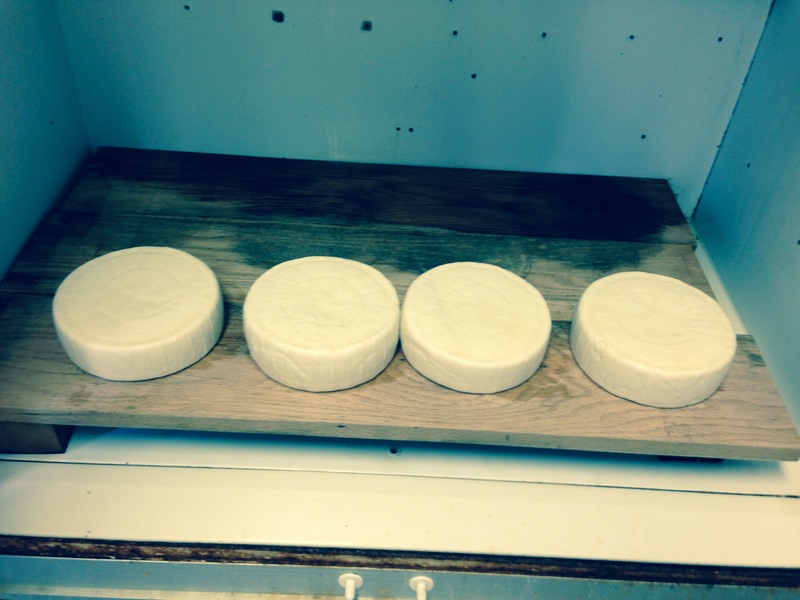 We kneaded the curd into the molds for the first few initial flips to get a good cheese shape. We made 4 cheeses from the 10 gallons and maybe we should have shot for only 3 cheeses (or maybe not – I’m undecided). The resulting cheeses are perhaps a little thin – but hey – this is pasteurized milk and these cheeses should ripen quicker so I’m not too upset by this. I started with the 2 qt. water bucket weights plus the bullet weights – after a few flips the bullet weights just seemed way too heavy and unnecessary so I ditched them and let the baskets just sit on each other. 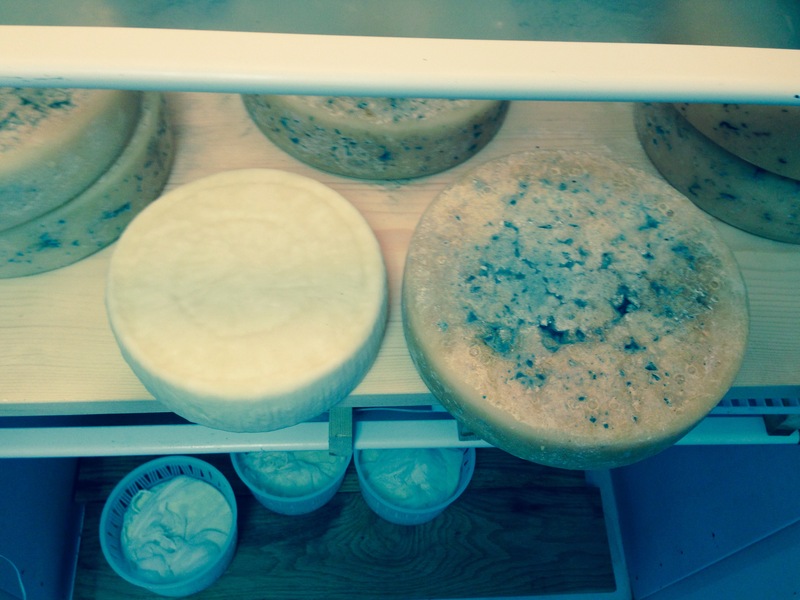 At the end of the day I put the cheeses still in the baskets in the ripening fridge to sit overnight. Lookin’ Goooood! – The cheeses were left in their baskets overnight in the ripening fridge so acid development could continue – and it seems to have worked a treat as the Ph of the cheeses this morning is a respectable 5.7 and perfect for salting. And they look great! 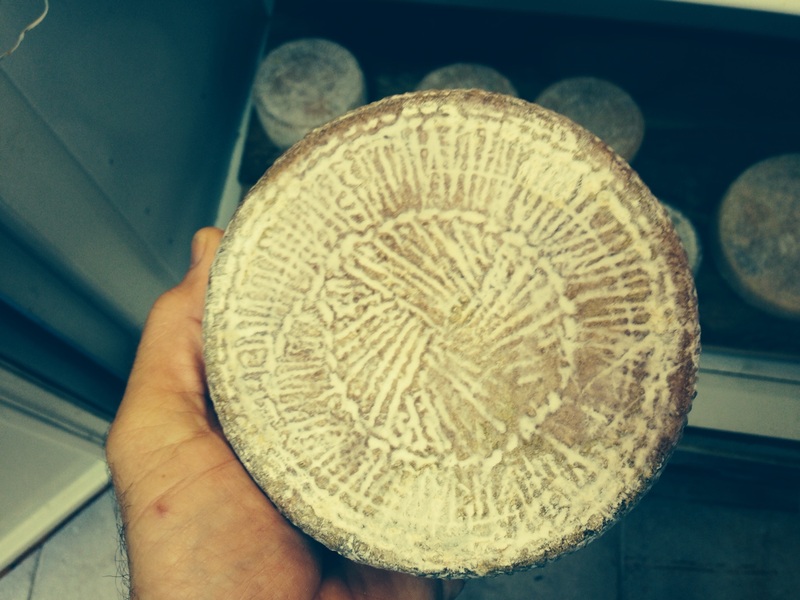 Closed rind surface and a nice size. We didn’t salt the curd – these cheeses needed time to develop acidity and salting the curd would have killed that process. Originally I thought I’d brine them like the big wheels but seeing them this morning made me think I could hand salt these cheeses quite successfully. Not much can be tinkered with here – 55F at high humidity – but what I can do is give them the loving attention they deserve – brine wash them occaisionally to get an initial decent rind formation etc. – so we’ll see. So all in all it was a successful make! – And, once again, has pointed me in a new direction (startin’ to feel like a damn weather vane!). So the next make will be the same with just one adjustment – a little more Flora Danica and a greater initial ripening time for the milk. I’m going to attempt to diligently document the ripening of this cheese by taking a daily photograph of the same cheese over the next 60 days – and then string the photos all together in a little video clip – fun, huh? – stay tuned! Great post, enjoyed reading it. Looking forward to the 60-days video!